I'll admit this now. These are still cooking but I thought I would share the recipe now before I get distracted again. I have had a day of measurements and maths: weighing ingredients, analysing my old wheat containing recipes, converting measurements and writing new recipes for work before I spend a happy day baking tomorrow. Anyway, all that meant that I didn't get into the kitchen at home till well after 5. 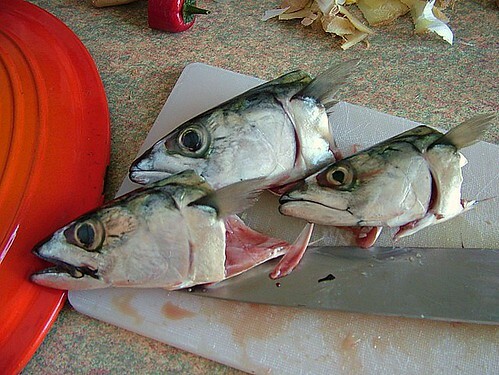 The mackerel need a good 2.5 hours to cook, so they are now going to be tomorrow's dinner! I picked up these mackerel from one of our local fishmongers today. They smelled lovely, were rigid with rigor mortis and glowing with beautiful fresh green, silver & blue tones - fresh from the sea. This is why I love living on the coast. I'll be serving these with brown rice and simply steamed cavolo nero and I'll post a photo tomorrow when we eat them! 1 small mackerel per person, gutted with head and tail removed. Finely slice the ginger and garlic. Break the chilli into a couple of pieces. 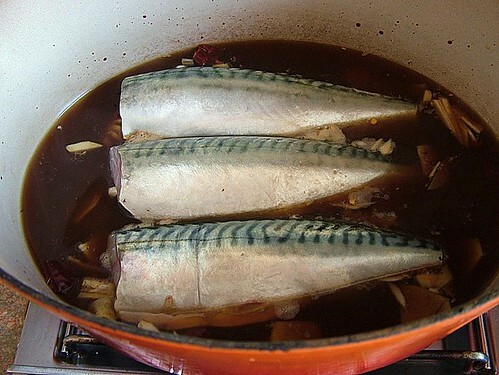 Find a pan with lid that will hold the mackerel snugly (note from the photo, mine doesn't!). Lay the mackerel in the pan and sprinkle over the aromatics, then add the tamari, cider vinegar and your sweetener of choice. Now pour the apple juice over the mackerel to cover. If you have been sensible in your choice of pan, you should only need about 500ml, in my case, as the pan was huge I used a full litre. If you are making this for 1 or 2 people I would cut the mackerel into steaks and lay flat on the bottom of the pan. Adjust the cooking times, as they will only need around 3/4 hr - 1 hr. Set the pan over a heat and bring to the boil (stay close). The moment the liquid starts to bubble put the lid on and turn the heat down as low as you can. Now just leave well alone. If you can see steam escaping from the pan, you can put a layer of foil under the lid to create a better seal. Check the pan every half hour or so to make sure the fish are still covered in liquid. This will be cooked in 2.5 - 3 hours depending on the size of your fish. The fish should be firm but tender. Carefully lift the fish out on to a serving plate and turn the heat up. Let the liquid bubble away to reduce and create a thicker sauce - about 1/3 volume. Test for seasoning, adding a touch more sweetener or tamari as necessary to create a hot and rich sauce. To serve, spoon the sauce over the whole fish and serve with rice or noodles and simply steamed green vegetables. You can eat the bones when the mackerel are cooked like this as the slow cooking softens them.